On Wednesdays we Rosé! 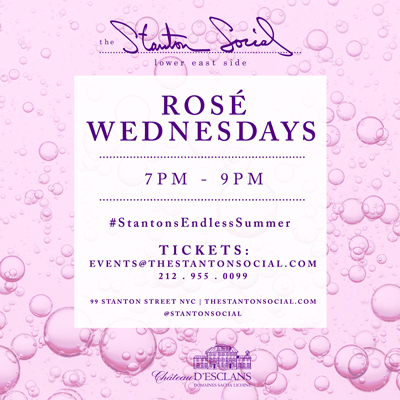 We’re kicking off #StantonEndlessSummer’s Rosé Wednesdays sponsored by Chateau D’Esclans. Enjoy four glasses of rosé and delicious passed appetizers from 7-9pm in the upstairs lounge at Stanton Social. Reservations exclusively by emailing events@thestantonsocial.com or by calling (212) 995-0099. You don’t want to miss this!